Radiantz supports Victory Jackpot LED turn signals for your exciting road trips. Select our brightly lit license plate frames or opt for sleek styling. There's more to our LED products than just 2006 Victory Jackpot rear turn signals. Try our Forkerz, sold in pairs, to decorate your bike's fork construction, or add our patented Z-Flex LED array to almost any free area on the bike. We're proud to be your first choice in LED accessories since 1999. With our free shipping on orders above $150, purchasing turn signals for Victory Jackpot bikes should be your top priority. Communicate your intentions on the road so that there's no question about your turns or merges. 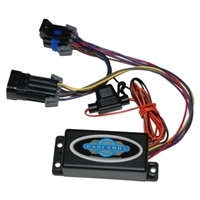 We offer standard blinkers for your Victory Jackpot rear turn signals, or opt for sequencers. Radiantz has your Victory Jackpot front turn signals in stock. It's time to upgrade your accessories to LED brilliance.